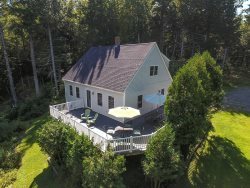 Located at the end of desirable Canns Beach Road in Owls Head in a traditional waterfront community. The cottage includes incredible sweeping views of the ocean, a great lawn, wonderful deck, and comfortable interior furnishings. This property is a perfect getaway for any group. It is also a great property for a first-time visit to Maine. (We love the view here so much, we have used the main photo for this property for some of our print advertising). Owls Head offers great sandy beaches, a quaint general store with award winning food, and it is within close proximity to popular Maine communities Rockland and Camden. There are numerous places to eat, hike, shop and sight-see all within a reasonable drive. BEACH CLASSIFICATION: We have categorized this property as having or being near a sandy beach. More specifically for this property - it is a short 5 minute walk along the shore to sandy Crocketts Beach. There is not an actual usable sandy beach in front of this property, but the nearby beach is great for kids and that is why we have classified it as being on or in this case - "near" a sandy beach. Linens & Bath Towels: Yes, one set of bed linens and one bath towel set for each guest are included (beds are made up prior to guest arrival). Having rented through the 'giant' vacation rental websites before, we were so much happier and pleased with the personal, one-on-one approach with On The Water. I was struck with the levels and thoroughness of communication. The staff were always friendly and truly glad to be of service. Our stay at Cannes Beach Cottage was the highlight of our year. It was a beautiful location, clean as a "pin", well "outfitted" for all our needs. We were dumbstruck at the windows overlooking the water, island and beach/harbor. The shade trees all around helped reduce the glare and heat. We loved the furnishings - ample and spotless. Having two eating areas was a plus. Everything was fantastic. I have rented several houses through your agency and have always found you to be very organized and courteous. Last year we rented a house through an agency on Cape Cod and did not have such a positive experience, so I appreciated it even more this year. This was our 3rd stay at the Cann's Beach House and it was another enjoyable stay. It was hard to leave that beautiful ocean view behind. As always the supply of linens, made up beds and cleanliness were a nice welcome upon our arrival. As always,the few problems we had, were quickly addressed. This cottage is or favorite. We love the upgrades and were so happy to enjoy the wonderful beds, well equipped kitchen and the perfect spot to totally unwind and share with our family and friends. We have always had a great renting experiencing with On the Water. Rarely, have we needed anything, but when we have the request was granted quickly. I also very much appreciated the early call on Friday saying that property was available. Hands down, our favorite feature is the view and access to Crockett's Beach. I was disappointed to learn of the "behavior changes" asked of the guests (and Ellis Family) in regards to the neighbors to the south. We had no issues with them, and in fact, I intentionally struck up friendly conversations early in our stay in order to alleviate any problems during our two week stay. I did miss the fires by the ocean, however. The agency was great, we had a couple of questions that were anwsered very quickly, and Meg notified us that the rental was ready an hour before schedule. Easy to work with, great personalities. Our house was beautiful, excellent location, we had a blast tubing and kayaking off the rock beach. Located close enough to Rockland, attended the Lobster Festival, ate at some nice restuarants. Flew out to Matinicus Island for a day. Would certainly vacation again in this area. On the Water in Maine, Inc. is a great agency to work with. They respond quickly to any questions and made the entire rental process easy. Many details were provided which eliminated the need for questions. The directions to the property were easy to follow. Also, I did call the agency on one occasion because the propane tank for the lobster pot was missing. Although we were instructed to take the tank off the grill to use, another tank was delivered to the cottage for the lobster pot that same day. This was appreciated. The property exceeded our expectations. The kitchen was fully stocked, the bedrooms very comfortable and the living areas are spacious. The view was our favorite feature. We enjoyed the deck and the spacious lawn as well. Your agency is very thorough and organized. Our rental experience was very positive. You responded to all of our questions very promptly. The Cann's Beach house is in a beautiful location with gorgeous views of the ocean. There was plenty of room for our family (8 people) ranging in age from 85 years young to 16 years. We enjoyed kayaking and tried out a paddle board for the first time. It was nice having the beds made up when we arrived, and the kitchen was fully equipped for preparing meals. We had a wonderful vacation and were sad to leave. Great team at On the Water in Maine, very efficient, prompt email and phone replies when I had a question. Our family loves Canns Beach Cottage! Our favorite part is the incredible lovely view, and a short walk to sandy Crockett's Beach. This is the 2nd year that we have stayed for our family reunion. The new furniture in the basement is comfy and the additional sofas and chairs in the main living area are too and really a plus for gatherings or so we can just spread out and relax. The open spaces on the floor and the extra table let the cousins play boardgames and we are always mesmerized by looking out the windows at the view. We had a fire down by the rocks a couple of nights, cooked marshmallows and sang our sing-alongs. Your house is a treasure filled with warmth and love! We hope it is available for our next reunion. A brighter light at the bottom of the deck steps would help us older folks. Thank you so much! On the Water in Maine is a very nice helpful group of people. Lovely home thank you for sharing! The view was spectacular. The close proximity to Rockland was a bonus that we were not expecting. The house was well appointed even for those of us who cook on vacation.